Muimbai: Su-Kam Power Systems Ltd (SKPSL), which makes power devices such as batteries and solar panels, has drawn interest from a clutch of potential suitors looking to acquire a controlling stake in the company, two people directly aware of the development said. 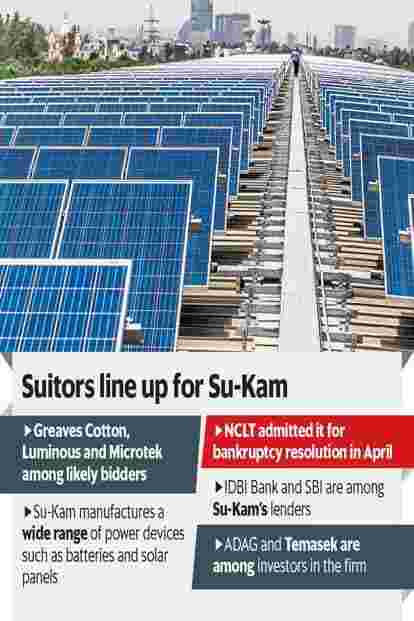 Su-Kam, currently under corporate insolvency proceedings, is likely to be put up to bidders and has received informal interest from Greaves Cotton, Luminous Group and Microtek so far, the persons cited above said on condition of anonymity. More suitors may join the race once a formal expression of interest (EoI) is sought, the persons added. Su-Kam was referred to the National Company Law Tribunal (NCLT) for bankruptcy proceedings by the State Bank of India (SBI) in November last year and was admitted in April by the court, following which Rajiv Chakraborty, Partner PWC India, was appointed resolution professional for the company. “The date of EoI will be decided in the next CoC meeting which will meet in the next four weeks," said one of the people cited above. “There is already significant buyer interest for the company and the resolution is expected to take place much ahead of the stipulated 270-day deadline under the insolvency and bankruptcy (IBC) code," the person added. The company has total unpaid debt of close to Rs370 crore of which IDBI Bank and SBI own the largest share. Apart from the aforesaid suitors, there is a high probability that Su-Kam’s promoter Kunwer Sachdev will also be allowed to bid for the asset since he is not a wilful defaulter and the NPA is not a year old yet, said the second person cited above. “But his eligibility is still being evaluated by the resolution professional, the person added. Emails sent to Su-Kam, Greaves Cotton, Luminous Group and Microtek remained unanswered till press time on Monday. A PWC spokesperson declined to comment, citing client confidentiality. Su-Kam Power Systems, founded by Sachdev in 1998, manufactures power back-up devices such as solar power systems, inverters, and uninterruptible power supply systems for home and commercial use and batteries, etc. In 2006 Reliance India Power Fund acquired a 20% stake in the company in a ₹ 45-crore deal. The $200 million private equity fund was jointly sponsored by the Anil Dhirubhai Ambani Group and Singapore-based Temasek Holdings (Temasek) and managed by Reliance Capital was mandated to invest in Indian power companies. According to a credit rating report by India Ratings, the financial profile of Su-Kam began declining in 2016 due to a revenue decline in its battery and solar project segments. Revenue from the battery segment fell 41% that year because of a technical fault. This also led to a spike in warranty costs, thereby lowering segmental profitability. In addition, the company’s solar project segment revenue also declined 88% due to limited solar project orders received during FY16.